In my previous post, I showed some steeplechase action. 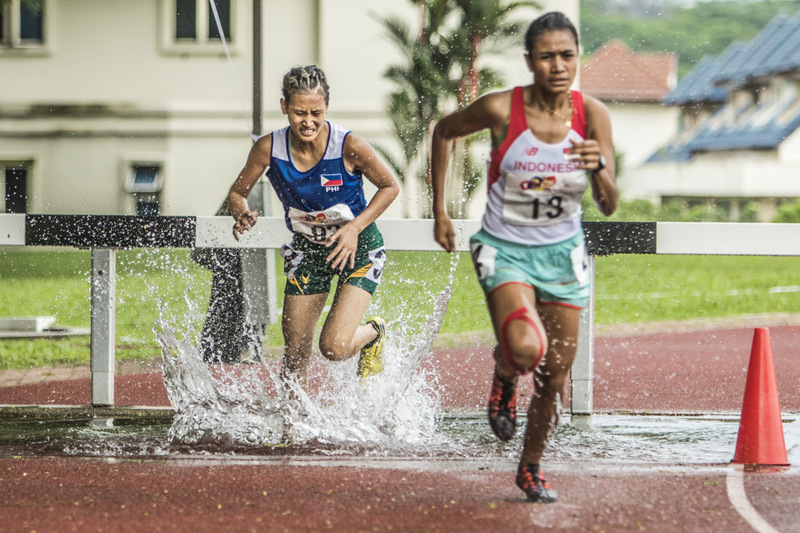 The women too did not have it any easier as they had their 3,000m steeplechase to overcome. I would be shocked if I attempted it and NOT fall flat on my face in the water. Magnifique ! On voit bien la douleur de l'effort sur leurs visages. Ayush Basu: Oh they certainly put in tremendous effort, Martine. Both these ladies found a place on the podium. Great action shot of these athletes! I, too, would end up face down in the water! Ayush Basu: I am pleased you like this action, Elizabeth. Some more to follow. Ayush Basu: You are absolutely right about that, Chris. You're totally rocking on these action images, Ayush. WOW. Ayush Basu: You are too kind, Ginnie. Ayush Basu: I was privileged to be a witness to some moments sporting joy and heartbreak, Lisl. This is an excellent sports action image, Ayush. She seems to have stepped right into a puddle Ayush. Ayush Basu: There was no going around on this occasion, Chad. A long race - sometimes, getting wet is a blessing. Ayush Basu: You are right about that, Louis, but I think that pit filled with water was not the ideal coolness the athletes would have liked sprayed over them. The water would feel so great when you are hot. This is an excellent shot to show what the athletes are feeling. Ayush Basu: You are right about that, Mary, but I think that pit filled with water was not the ideal coolness the athletes would have liked sprayed over them. This event is killer for the knees and ankles, I assume. Ayush Basu: Dropping in to the water filled pit from that hurdle is not my cup of tea either, Martin She has my sympathies. Oh, she did make it to the podium though! Ayush Basu: Oh yes, Larry. I am trying to imagine their knees and ankles after doing this a bunch of times. Ayush Basu: Thank you, Frank. I was well positioned for them. Ayush Basu: Very kind of you, Anne. They were a determined bunch. Ayush Basu: I did a bit of track and field when I was in school but this is not an event for me, Bill. Thank you for the remark. Ayush Basu: They were a determined bunch, Cherie. I thought the flying water added a lot of dynamism to the images. wow now that's some girly action!! great shot!! Ayush Basu: Thank you for the generous remark, Elaine. Girly maybe, but tough girly. The runner from the Philippines does not look like she's enjoying herself. Ayush Basu: She just wanted to get over with it, Larry. I cannot blame her!